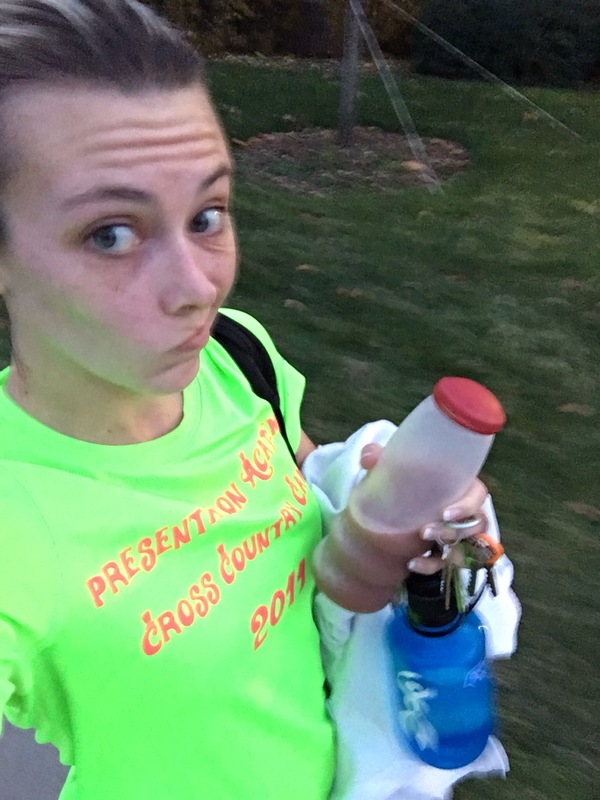 Weekly Recap: Recovery week 5 / 1 week to Otter Creek | Runner. Writer. Renegade. Leaving the gym Friday with Recoverite in hand, just before finding out I’ll be a Hammer ambassador in 2016! Exciting news! I have been selected as a Hammer Nutrition athlete for 2016! Stay tuned on that front — once we roll into the new year I’ll have a referral code for you fine folks along with reviews, recommendations, etc. I’m excited to be an ambassador for Hammer Nutrition — if you’ve been reading this blog at all, you’ve no doubt heard me sing high praises for Recoverite in particular. I’m also a big fan of their bars, gels and endurolytes. As I’ve explored the product line recently, I’ve noticed several additional products I’m excited to try. As for the week … Nice week. We’re having bonkers weather and it’s been in the 60s — and even 70s — all week. Humid, too.Monday I hit early morning spin, a class I really love, and then stretch and abs. I noticed in stretch and abs that my piriformis was tight on the right — wasn’t sure though if that stemmed from cycling or from the previous day’s long run. Tuesday I planned to run 6-8 miles and then go to yoga but my legs protested. I felt flat and like I was working harder than I should’ve been. I took that as a cue to call it a day after 3 miles. I also figured that I hadn’t taken a rest day in 10 days — I’d had some shorter days and some days where I spun instead of ran, but nothing off. So I also pulled the plug on yoga, too, and ran errands instead. Tuesday’s flop didn’t instill much confidence for Wednesday — I had penciled in a speedwork session for one of the two days just depending on schedule and legs. To ease back into speedwork (other than racing the 5k on Thanksgiving, I haven’t really done any since the marathon, although I’ve run pretty hard/fast a few days), I planned 3×1200 meter cruise intervals, which is a bit between tempo and 5k pace. To my surprise, I felt great on Wednesday morning. Perfect weather, too. I hit pace on all three intervals at an appropriate effort, and finished the day with 6×100 meter strides. Since I missed yoga on Tuesday, I was going to hit Pilates on Wednesday, but ended up with other plans. Meeting a new baby + family Christmas = more important. I ran early again Thursday, easy pace and beautiful weather again. I absolutely love when it’s in the 40s-50s. That evening I went to Pilates Strength and got my tail kicked. Friday was a bit of an aberration. I don’t run after work very often, but that’s how things shook out. I started off easy on the first two miles and felt good — before I knew it I was zipping right along. A couple middle miles in the 7:20s and then I decided what the heck, let’s blow the pipes out a little. So I went 7:07 and 6:38 for the last two. Whoops! It was a good day to have my heart rate monitor on though. My average was 153, perfectly fine. I did spike it to 179 in that last mile right at the end. No surprise there. My weekend was great — I had running partners both days. Saturday was my sleep in and bum around day … or was going to be. Around 8:30 my friend Shannon texted and asked if I wanted to run, so I hopped out of bed and met her about 30 minutes later. This run was supposed to be nice and easy, and we started off on trails. Those first two off-road miles were easy, but then we hit the road and things dropped substantially. Our last 5 miles averaged 7:31. Fail again. Unfortunately I forgot my HR strap so I don’t have that data, which was also a bummer because I like to wear it for Pilates, which I went to at noon. It was a rare Saturday for us with no plans, so we had a nice lunch, watched a movie and went bowling. Sunday I had company again, an entire trio of ladies. There was a request to start later than normal, which was fine by me — they were planning 5-6 miles at 9 a.m. and I needed 12-14. That gave me two options — sleep in and start at 9 and do the additional miles solo at the end … or start earlier. Eventually I settled on running from the gym to the park and stretching it out to 5-6, running with them and heading back. That would basically force me to do 14, but if things were going really bad I could always bum a ride. My first 6 miles solo were pretty slow — the first one was over 8 minute pace. It was humid and my legs, not surprisingly, felt clunky. But mile 6 was back down to 7:40 and then I had people to talk to, so I figured it would be okay. I actually didn’t care what my pace ended up being, I just wanted to get it in the bank. That second half was pretty zippy, even the 3 miles I did solo at the end. (I actually expected to get lazy and slow down on the last miles once I was alone again. My assumption was incorrect.) I finished strong, with a 7:12. Little creaky in the ol’ hamstring, but that’s nothing new. I averaged 7:53 across the first 6 miles and 7:34 on the last 8. Guess that worked out fine. I wish I had been able to cross train a little more — another short spin session and a core class (yoga/Pilates) would’ve been perfect. But, I did get up to 42 miles so I’m very happy about that.